As we take some time to edit some of our latest projects we wanted to give you guys a look at some of our favorite ads. Whether a video has a small budget or a large one what is important is that there is vision from the start to finish. One of the best ways to do that is to see what success looks like in your vertical (what has worked for others in your field) and take cues from that. When we make videos for our clients, we want to make sure that they are memorable (some may even say award winning… more on that soon!) and that people will want to watch them again and again. One of the ways that we do that is to look at what has gone viral in the past and combine those ideas into what we do best… making kick*ss videos. The one that revolutionized Internet Advertising. A Spokesman for the Internet Age, with the jokes to match. They didn’t just think outside the box - they built a box outside the box so they could think outside the box outside the box (a saying that Damian thought of and is quite fond of). It works because it’s in your face, it’s funny, it’s memorable, and the production value is both unique and off the charts quality. Many have tried to emulate the style that Wieden+Kennedy put together for this ad, and almost no one has matched it yet. This ad was so big and so popular that Sesame Street parodied it. Grover is no Isaiah Mustafa, and that’s saying something. How do you build a startup from an unknown entity in a monopolized marketplace to selling to Unilever for $1 Billion (Yes, with a B) Dollars? You make a kick*ss video. Well, there’s more to it than that, but there’s little doubt that this video catapulted Dollar Shave Club to industry player, with their very first 12,000 customers jumping aboard within 48 hours of the release of this video and NO additional marketing. It plays to the strengths of Internet Advertising much like the Old Spice video above, albeit on a shoestring production scale comparatively. It’s funny, it’s memorable, and the founder himself slaps you in the face with a genuine confidence in his own product. It subverts traditional brand messaging by using self-depreciation. Most of all, it made us want to sign up, even though most of us have a permanent 5-o-clock shadow. Well done all around. It’s simple, yet brilliant. You take a Movie Star with an incredible skill, and combine it with an incredible product. The result? Lightning in a bottle. Unconventional Swedish agency Forsman & Bodenfors pulled out all the stops for this campaign. They focused on showing off the incredible engineering feats of the Volvo trucking team with incredible live stunts that would ‘wow’ viewers. And wow they did. They show off the revamped technology in a historically ‘dull’ industry with feats of human strength and achievement. It may be simple in concept, but no doubts on the effectiveness here. Another simple concept – but man o’ man does it hit home. This is a special kind of ad that grabs you emotionally and has something powerful to say – the product is almost secondary but by the end of the spot you have a newfound respect for them. It’s an important message, and an important topic, and it gets genuine people in a live studio to tell that story, highlight the hypocrisy of a stereotype, and spin that stereotype on it’s head all in one go. It works because it’s genuine, and because they have something important to say. We’re listening, Always – hats off to you. We Won Two ADDY Awards! We wanted to take a different approach than the rest of the treatment industry. Addiction is a serious issue, with very serious consequences – but it doesn’t have to be all doom and gloom. Getting sober is hard work, but a sober life can be a beautiful and wonderful thing for those in recovery. So we took the opposite approach – real addicts and alcoholics in recovery having the time of their lives. We love how it all turned out, and the American Advertising Federation did too. The artwork of children never ceases to amaze us. Since partnering with Budsies several years back, we’ve had the pleasure of watching them grow and continue to think outside the box. This was one of our favorite projects with them, where we got to pit two moms against each other in a contest for their children’s affection. It was a great deal of fun to shoot and see it shared all across the web. We’re glad the AAF liked it as much as we did. At Brave Man Media we love what we do, and we want you to know about it. We shoot music videos, TV commercials, web videos, help with companies’ brands and their products, and we have a blast doing it! But we do more than that – we film for several charities, have made short films for after-school programs in Florida and several films for an orphanage in Haiti. Because, sometimes you need a 30 Second Blockbuster and sometimes you need something else. The wonderful thing is that everything we do informs everything else we do – the documentary on a massive art installation, like the new Terrazzo Floor in Ft Lauderdale Airport’s Terminal Three, introduced us to flying drones indoors and some of our short films with after-school programs, like Zombie Love, taught us about working with kids and FX Makeup. And then sometimes, our work leads us to be introduced to really interesting people like the artist, Trevor Young, or the AIDS activist, David Furnish - Elton John’s Husband. Today, we want to talk to you about someone you may have never heard of, but who is, nevertheless, making a huge impact on our day to day lives. Every once in a while, during your travels, you might have been exposed to a public artwork or a public building that has moved you. 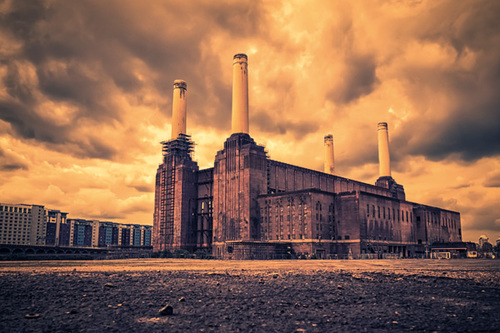 Famous examples are the Battersea Power Station in London, immortalized in Pink Floyd’s iconic album cover for Animals or Robert Indiana’s LOVE sculpture in Philadelphia. These art works and public buildings were created by a unique group of people who are committed to making an impact on our environment – both mentally and physically. They make us think and help make where we live a better place. Recently we have been approached by Michael Singer Studios for the rare opportunity to capture the outstanding creative process that has given birth to some of the most impressive architectural projects in the last twenty years. It was also a rare opportunity to spend time with Michael Singer himself, who is one of the most significant artists of the past 50 years. Twenty years ago, most public works facilities and power plants were hidden from view – almost always built far from wealthy communities, with little regard for the poorer communities that ended up having to accommodate them. Michael Singer Studios is on the forefront of the wave of incredibly talented designers and architects who are changing all of this. They have completely flipped the script on design and environmental awareness. Project by project, Michael Singer Studios is taking their ideas and principles to a city near you; taking things that are typically concrete and square, and turning them into useful, beautiful works of art, respecting the communities where they are located and making these projects more desirable for communities that, in the past, would have never allowed them to be built in their vicinity. Take for example the Phoenix Recycling Transfer Center. What most people would think about as another piece of infrastructure was completely changed when Michael Singer Studios was chosen to lead the design process. What the city of Phoenix got was a dynamic facility that is not only functional, but beautiful. It was even chosen as one of the eight most important architectural projects of the year by the NY Times - and it was designed by an artist and his team. This facility has many creative accents including the use of skylights and mirrors to increase light in central areas, the removal of many support trusses to increase available space, and a unique viewing area for visitors. The building became so monumental to the city of Phoenix that people needed a place to see what was going on inside. This facility (referred to as the 27th Avenue Project and even, sometimes, the Taj Mahal of Trash) was so interesting to the public, because of its fantastic design, that the city of Phoenix had to immediately upgrade their automatic sorting facility to keep up with the incredible increase of recyclable materials brought in by the community. Who could have imagined that just by choosing the right design team for a building you could have such incredible impact on an area and the environment? Talking about something a little closer to our Delray Beach studio is the West Palm Beach Waterfront Pavilion. A LEED silver community building is incredibly unique. It is home to green markets, conferences, weddings and other community events. The 6000 square foot building is powered entirely by a 17kW solar tile array. The building can be lit, and ventilated with no outside energy consumption. If you are interested in more of how this works, this unique site actually displays how much solar power is being used and consumed by the pavilion itself. Ideas and concepts like this give cities an opportunity to make a difference in the lives of their communities by giving them something they need and also something that will have a lasting impact on the environment. Brave Man Media In The Press! It is always great to see your hard work appreciated. Check out what the press is saying about our newest work on the music video "Connected" by Sophia Kameron. "South Florida based production company Brave Man Media, head-quartered in Delray Beach, just finished production in Los Angeles on Sophia Kameron’s new music video “Connected”. The video, which you can see here Connected, has already debuted on YoungHollywood.com. Brave Man Media will always have their home base in Delray but they understand the importance of having a strong presence in LA. Their main focus are commercials, like Attorney Lee Cohen’s Call Lee, Call Lee, but Brave Man Media loves stretching their creative wings and music videos are a great way to do this. They’ve found that this kind of creativity feeds into to everything they do. They are now in post production with their second music video this year for indie rock band Raggy Monster to be released fall of 2016. Known primarily for their cinematic and creative commercials, Brave Man Media is also expecting to release their first feature length film, Over Easy, in 2017. For Sophia Kameron’s music video, we put together an exceptional team. Trudy Bellinger, our Director for 'Connected' spends her time between Los Angeles and London, where she is already an A-List Director. We're very excited to see her grow here in the States. Our LA Producer, Shannon Bowen, assembled tremendous talent in every department and they were instrumental in executing Trudy's vision with passion and grace. You can see more of Brave Man Media’s work here on their webpage." When you want to make a video to share on Facebook or YouTube having the right marketing video company can make all the difference. Whether it is serious or light-hearted, you want always want a mini Blockbuster that is going to be shared all over the internet. In this day and age there is no mistaking the fact that when it comes to viral videos there is nothing that can stop them. Although cats and sneezing pandas can help, knowing what makes one video go viral versus another is pretty much the video equivalent of the Bermuda Triangle. One thing we do know is that if your video is not eye-catching from beginning to end you may as well send that sneezing panda straight back to China. Throughout the campaign the constants were the actors Justin Long as the laid back Mac who never has issues, and the often-frustrated Phil Morrison as the uptight PC. These ads were memorable because they followed a simple format of a white background and quickly addressed common PC user issues. Whether the marketing video company chose to poke fun at a new Apple innovation unavailable on PC or the ad featured a celebrity, they followed a similar theme targeting frustrated PC users. Fast-forward to a year ago when Alex Furmansky the CEO of a company called Budsies started looking for a marketing video company to make some unique fun content for him and his brand. Budsies is a company that brings children’s art to life by turning their drawing into a stuffed character that is customized to be just like their work of art. Truly a unique idea! When he found our team at Brave Man Media he knew it would be a match since he wanted to do something creative and clever with his marketing. Alex and Brave Man Media chose to take inspiration from the Mac vs. PC commercials and created a series of videos that were unique, clever, and tailored to the target consumer. Not unlike the Mac vs. PC campaign our marketing video company shot the Budsies videos on a white background and featured the same actors and actresses in each video. In the videos for Budsies we chose to use two mom characters that both wanted to preserve their children's art. By using characters that represented the target market of parents who wanted to do something special for their children we were able to convey our message very concisely. The mom on the left who ultimately chooses to make her sons art into a Budsie is constantly interrupted by the other character who uses rudimentary methods to immortalize her daughters art with Coffee mugs, or mouse pads. Much like the Mac vs. PC commercials the mother on the right thinks she is doing something unique (like the PC) but is quickly one-upped by the mom who chooses to a far more clever solution (the Mac), the Budsie. All of the indicators helped assist the viewer in digesting the video from beginning to end ultimately compelling the viewer to seek more information about Budsies. As you may know any marketing video company could have made a video about Budsies, but the team at Budsies chose Brave Man Media because we have what it takes to make unique quality content! We do more than show you the product, we work to engage your viewer and provide you with a video that you and your customers cannot wait to share with their friends. If you are looking for a high quality marketing video company then look no further than Brave Man Media the home of the 30 Second Blockbuster. Wanna talk about your video? Shoot us an email with some of the who, what, where, when and we can get together. No matter what you want we have the team to get it done. Go ahead and let us know what you want and lets get it done together. So What DOES a $100k Web Commercial Look Like? Post-production was carried out by our talented staff of editors, sound engineers, and colorists. Wrapping up 'Rockstars' was like sending your kids off to college; happy to see them taking on a life of their own, but sad to know the job is done. Impressive, right? Not everyday you get a live helicopter in your commercial or 150 extras - even if they ARE volunteers being swayed by the promise of catered Southern BBQ. First off, welcome to our new blog. We're pumped to share our latest and greatest project with you! Brave Man Media just wrapped on an amazing web commercial shoot with The IT Advisors in sunny South Florida. We pulled out all the stops on this production... shooting at 8 locations (all the way from Miami to Port St. Lucie), including a multi-million dollar data center, a hospital, and an airport - helicopter and all! We shot almost the entire commercial on Steadicam; as our Director of Photography, Mike McGowan, would tell you - those R.E.D. Epic Dragon cameras aren't exactly light. It does look slick though! A big thank you to our stellar crew - from Production Assistants to Gaffer to our wonderful on-screen talent. We had an epic time and are excited to see how the video comes together. Keep your eyes peeled for the finished video and prepare to have your mind blown. Make sure to follow Brave Man Media on Facebook to see what else we’ve been up to! In the meantime, enjoy this sneak peak in the form of a slick Behind-The-Scenes video.